My friend wanted a pair of socks like the ones I was wearing at the time. So here they are. 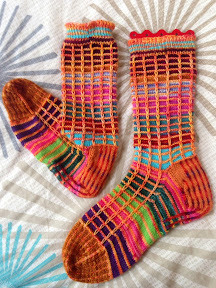 This Tetris Sock pattern makes a great pair of socks using up the leftovers from other projects. I find sewing in the ends a bit tedious and don't bother unless it is crucial. I've told Brigid that they will be a bit "hairy" on the inside.